Our Homemade red sauce topped with Italian ground sausage, bacon, ham, pepperoni, with a blend of cheeses. Starts with our Homemade Garlic Sauce, topped with broccoli, cauliflower, tomato slices and mozzarella cheese, finished with herb seasoning. Pepperoni, Ground Beef, Italian Sausage, Roasted Sweet Peppers, Hot Banana Peppers, Jalapeno Peppers, Mushrooms, Onions, Ham, Black Olives, Anchovies, Broccoli, Cauliflower, Tomatoes, Spinach, Bacon, Artichokes, Pineapples, Eggplant, Salami, Ricotta. Chicken, Steak, Double Cheese, Chicken Parmesan, Ravioli, Crispy Chicken. 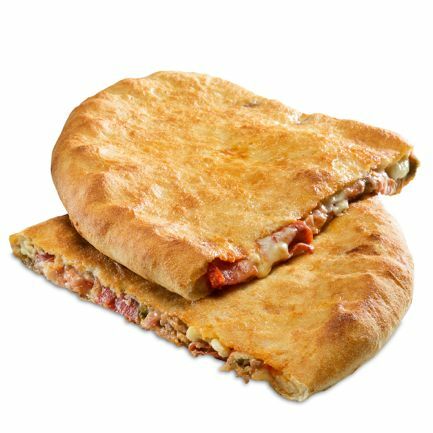 Original-- folded pizza dough, filled with generous portions of italian sausage, Pepperoni, ham slices, roasted sweet peppers, american cheese, grated ramano, mozzarella, and out homemade red sauce.